• Dividend: The number or expression you are dividing into. • Divisor: The number or expression you are dividing by. where c is any constant (positive or negative). gives us another way to evaluate a polynomial at c.
• Factor Theorem: c is a zero of P(x) if and only if x - c is a factor of P(x). 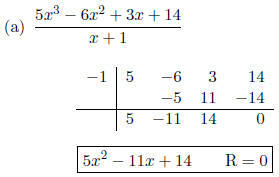 Steps for synthetic division to divide P(x) by x - c: Synthetic division will consist of three rows. are missing, place a zero in its place. 2. Bring the leading coefficient in the top row down to the bottom (third) row. under the next coefficient and add these two terms together. 4. Continue this process until you reach the last column. will have one degree less than the dividend. Example: Divide P(x) = 2x4 - 8x3 + 5x2 + 4 by x - 3. First, note that the x term is missing so we must record a 0 in its place. 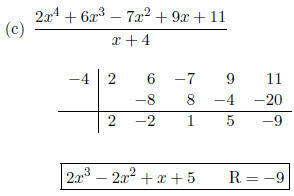 Therefore, the quotient is 2x3 - 2x2 - x - 3 and the remainder is -5. 3 0 - 5 0 - 2. • Remember to add the terms inside the synthetic division process. divisor is x + 5 then we record a -5 on the outside of the synthetic division. 1. Use synthetic division to find each quotient. not forget to place a zero in its place. forget to place a zero in its place. be recorded in their places. 2. Use the remainder theorem to find P(c). not forget to record a zero in its place. x - c is a factor of P(x). if and only if -1 is a zero of P(x). up with a zero remainder.